PLOT SUMMARY: Victor Vale and Eli Cardale met as college roommates just over ten years ago. In their senior year, Eli chose ExtraOrdinary people -- EOs -- as his thesis topic. EOs are people with supernatural abilities, and, Eli finds, people who have come back to life after dying. Victor decided to assist Eli in his research, and maybe even becoming EOs themselves. Now, a decade later, Victor is freshly broken out of prison, an EO, and aided by a twelve-year-old girl and a fellow escapee. Eli, meanwhile, is on a mission to kill all EOs. (Himself excluded, of course.) Victor is coming after Eli with everything he has (not that he has much), and no matter who comes out on top, it's going to be one hell of a night. FIRST THOUGHTS: A few months ago, I was in a bookstore, skimming over a few books by this author, and this guy who was next to me asked if I'd ever read anything by her before. To which I replied, "No, but I own Vicious -- I just haven't gotten to it yet." And he said, "Oh, man, that one's incredible. You'll love it." Well, random dude in the bookstore, this one's for you -- because you were so right. This, along with The Hearts We Sold, will probably be the book I annoy everyone with for the next couple months by shoving it at them and saying, "READ IT." Seriously. It's good. THOUGHTS ON PLOT: This is a story told in anachronic order, spanning over about ten years. We see Eli and Victor's origins as EOs, and what they've been up to since they parted ways. No superhero/supervillain is complete without a good origin story, and this one didn't disappoint. I also really love the "how we got here" setup -- we start off with being dropped into the middle of the story, and then the backstory gets filled in around it, so we slowly understand what led us to this point. I really loved how all the characters' personal drama weaved together to create this big, dramatic plotline, and how everyone seeing to their own interests added fuel to the fire. I also really loved the ending of this book -- I know a lot of people found it underwhelming, but I personally thought it fit perfectly. THOUGHTS ON CHARACTERS: One thing I should specify is that neither of our leads are particularly good people. The difference is that Victor is self-aware, whereas Eli... hoo boy. Myself, I am firmly Team Sydney. Sydney is the one true hero in this book. Sydney and Mitch. I like Mitch. Truth be told, I like Victor and Eli a lot, too -- they may not be admirable characters, but damned if they're not compelling ones. It's a classic "black and gray" morality situation. There are no heroes, really. Just comparatively less awful people to root for. But Victor is so well-written, and just sympathetic enough, that even when he's doing awful, awful things, you're still compelled to cheer him on. He's exactly what a villain protagonist should be: despicable, and all the more lovable for it. THOUGHTS ON WRITING STYLE: I've heard great things about V.E. 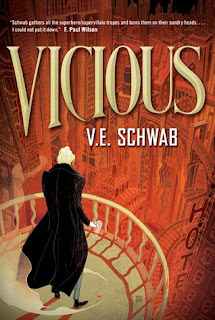 Schwab's writing before, so I'm pleased to report that it lived up to the hype. While her prose was very descriptive and painted a vivid picture, it also avoided falling into purple prose. Some of you may have noticed that purple prose is one of my writing pet peeves, so this was definitely a point in the book's favor. I was instantly drawn into this story, and I thought that Schwab's worldbuilding was really, really good. I really want to hear more stories from this world -- and, luckily, with sequels coming, I'll be able to in the future! THOUGHTS ON POLITICAL STUFF: In a book where everything is nearly perfect, it's a shame that this is where it falls flat. There are no queer characters that we know of, and save for one character who's implied to be Latino, no characters of color. (Though popular fandom consensus seems to be that Mitch is black -- his appearance is never really specified beyond "tall and muscular," but I saw some really good fanart that portrayed him as black and I honestly can't picture him any other way now.) There's also a female character who seems to exist largely to further a male character's character arc via dying -- this is called the Disposable Woman trope, also known as Women in Refrigerators. It's been a hallmark of comic books and superhero stories since forever, the most famous example being Gwen Stacy. I can't decide whether the trope's use in this book is a straight example or a parody. (This is a deconstruction of the superhero story, after all.) I almost wonder whether I should bother avoid mentioning said character's name, since it was clear from the moment she appeared that she was screwed. Which was a real shame, because I liked her. FINAL THOUGHTS: I am so hyped for the sequel. Which won't be out for another year. (Hello, darkness, my old friend...) Since the story wrapped up so nicely, complete with a neat little bow, I am curious about where Schwab chooses to take it. I'm excited -- though this story is done, this world seems like it has plenty more to offer. If you haven't read it, please do. You'll be doing yourself a favor. If you've read Vicious, tell me what you thought of it in the comments below.